Pink Marl Elephant Stripe 100% Cotton quilting craft Fabric 60"
Lovely striped, blue, cream and beige shades, linen look style upholstery fabric.Clearance from a very upmarket sofa manufacturer, a top quality fabric. A durable and robust, fire retardant treated upholstery fabric. A quality heavyweight chenille, it is ideal for a multitude of furnishing projects including furniture and caravans.This appears to have been fire retardant back coated. Fabric Width is a minimum of 54"/1.38m - Pattern Repeat: ~ cm - Vertically and 19cm - Horizontally. Chambray is a plain weave poly cotton fabric woven with a coloured yarn in the warp and a white yarn in the weft giving it the effect of denim. Easy to work with and easy to launder. Feels and looks like 100% cotton but less prone to creasing. PATTERN REPEAT - Vertical -cm and Horizontal 13 cm - Fabric Width is a minimum of 54"/1.38m. FABRIC CODE: WUN6978. The Fabric Code will be WUN followed by a number. AB 31-33 & AB38 AB 44-56, DD7-11, FK17-99, G83, HS1-9, IV1-56, KA27-28, KW1-17, PA20-48,PA60-78, PH18-26, PH30-44, ZE1-3. FUN Rainbow Stripe. Each stripe is 11mm wide. DUSTY PINK AND WHITE THIN STRIPE LIGHT WEIGHT THIN POLY COTTON FABRIC. LIGHT BROWN / SAND STONE SUEDETTE FAUX SEUDE FABRIC. 61" / 152CM Width. 100% POLYESTER. SOFT TO THE TOUCH. THIS IS A RIGID FABRIC / NO STRETCH. This Fabric Can Be Used For All Manner of Purposes Inc. 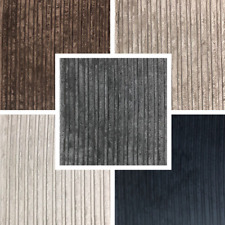 BEIGE - Chenille Upholstery Fabric - with a Striped design. - A quality heavyweight chenille, it is ideal for a multitude of furnishing projects including furniture and caravans.This appears to have been fire retardant back coated. 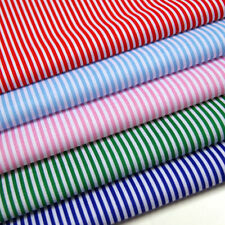 ROYAL BLUE AND WHITE THIN CANDY STRIPE POLY COTTON LIGHT WEIGHT FABRIC. NORTHERN FABRICS. Beautifully made high quality suiting fabric material. Specify length by quantity selected. White stripe width is 6mm, black is 18mm and stripes run across the width of the fabric. Classic striking contrast black with white stripe. Single Jersey knit fabric construction with a yarn dyed stripey pattern. STRETCH COTTON TWILL FABRIC. 98% Cotton 2% Elastane. STRIPES ALONG THE WIDTH OF THE FABRIC. This Fabric Can Be Used For All Manner of Purposes Inc. Fancy Dress. Fabric is cut from the bolt and multiple units will be cut in one continuous length. premium quality crepe dechine , soft drapy fabric dress making material. Condition is New. Dispatched with eBay delivery – Shutl 2-3 days. 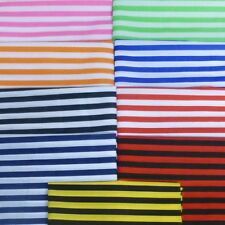 BLACK AND WHITE THIN CANDY STRIPE LIGHT WEIGHT POLY COTTON FABRIC.